The Waterpod ProjectTM has been floating around the New York area for the past few months gaining a lot of attention. 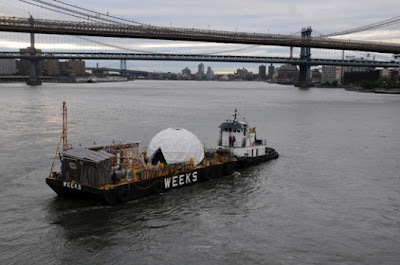 Beginning in Newtown Creek, between Brooklyn and Queens, the Pod is moving down the East River and Hudson River. As reported by Melena Ryzik for The New York Times (view her articles here) this experimental project investigates the blend of community living and artistry. Showcasing artworks, performances and such, the WaterpodTM, is an eco-conscious environment that was designed “In preparation for our coming world with an increase in population, a decrease in usable land, and a greater flux in environmental conditions, people will need to rely closely on immediate communities and look for alternative living models; the Waterpod is about cooperation, collaboration, augmentation, and metamorphosis,” explained Mary Mattingly, a photographer who thought of the Waterpod idea.